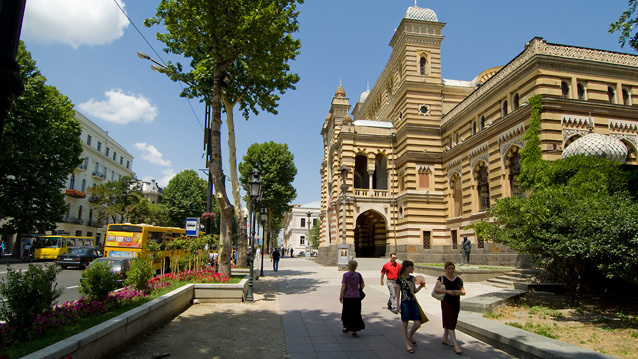 Walking the main street in Tbilisi is like a journey through centuries. Old buildings from the turn of the 19.th century mixed with stylish glass and concrete palaces. In front/right the opera building. The green river Mtkvari floats silent through Tbilisi. 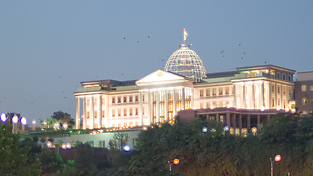 TBILISI IS THE CITY where the Asian culture meets the Western. This is the place all the great Russian writers spoke so well about, and the city European writers needed to visit in the 1800-1900. Among them the Norwegian Nobel price awarded Knud Hamsun. It's an old city, and you are better off reading about it here. We will take a closer look at the city of today in stead of dwelling with boring facts. Tbilisi of to day is developing rapidly. It is large, hot, and smells of flowers, spices, exhaust...and old culture. Today Tbilisi is a modern urban city, and are of more interest as such than a memorial over medieval dignity and greatness. The stinking rich and the extremely poor ones reside together and creates a unique atmosphere in the 1,5 million metro pole. Flashy new business palaces and worn out shacks are standing side by side. In Tbilisi you get the overwhelming feeling of a city in rapid change. The prices are rising quickly as foreign investors from Kazakstan, Russia and Saudi Arabia enter the scene. Pollution was overwhelming from the worn out car park in 2004-2006, but today it is amazingly clean air in Tbilisi. Allthough you would want to visit the newly renovated Mtatsminda amusementpark up in the hills above the city, Tbilisi is a theme park in it self. The variety of cultural impressions is overwhelming. One advice: Have relaxed attitude to things that happens. Most Georgians have. They are used to the unpredictable life. If electricity disappears, it will be back. If the water disappears: It will be back. Just relax. I think I heard they had a zoo, but didn't go there. 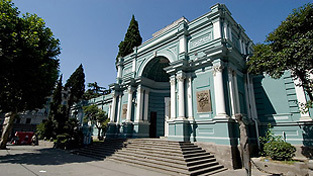 There's many exhibitions, galleries and museums. Great all of them. I spent 2 hours with a personal guide on the national museum. 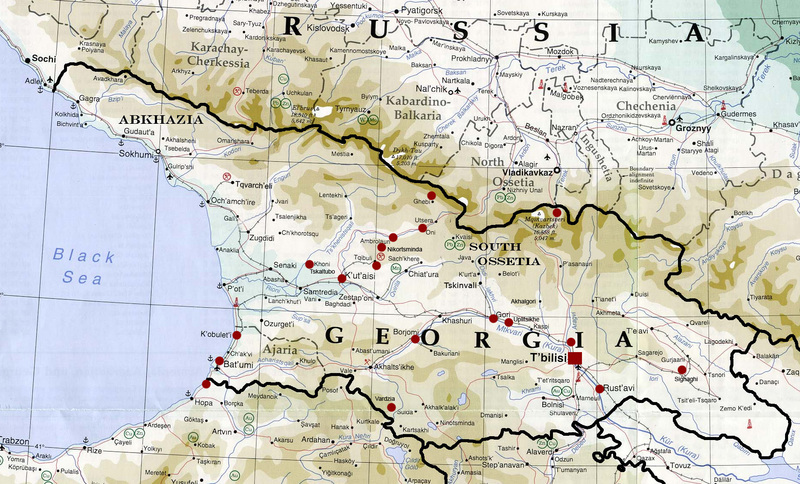 A breathtaking journey into ancient Georgian history. Do it! To balance this experience, I went to the bazaar. The bazaar in Tbilisi is a dive into salesmanship and “biological” variety of let us say unexpected organs. This is the place where people in Tbilisi buy their food. Georgians don't succumb to frozen pizza and burgers. They prefer fresh meat and vegetables. The animals here live normal lives on small farms; not stuffed together on a mass production line. The taste reflects it. Old Tbilisi is being restored with flashy art galleries, cool cafes and high quality restaurants. But at present there are not many westerners around. And when you start to recognize the tourist you saw two days ago, it is a strange feel of being in family. Another visible difference with other western cities is that you don't see any drunks or drug addicts in the streets. But what you see is not necessarily what's around. The streets are crowded with police, and almost each store and restaurant keeps a security officer equipped like any FBI agent. The good thing is that they aren't armed with guns like they used to be a couple of years ago. 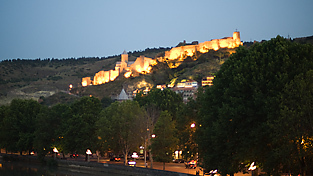 The nightlife in Tbilisi is limited. It's not like most big cites I have visited. There are some expensive clubs, casinos and of course the bars, but people don't stay out spending money they don't have. Usually there's not much action after one o'clock in the summer. The nightlife goes on with friends in their homes. The best bars you will find in the "Old Tbilisi" part of town. Most are of premium quality and heavily guarded by crew-cut polite guys with earplugs and blue shirts. Earlier they used to be armed, but now they seem to manage without the iron. Frankly it feels more comfortable to have a Borjomi or a glass of wine knowing you won't be gunned down by accident. A particulary pleasant meeting was the bars of the Kala-group. What makes them stand out is their professional and pleasant staff, and their innovative design. 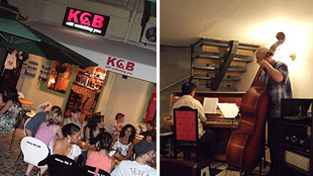 "The KGB-Cafe" is , together with "KALA" located on Erekle Street. The third bar is, like the name says "Near The Opera". The KALA-group consists of a family that started up The KALA bar on Erekle Street in 2004. In fact it was my favorite even then. Since then they have opened up two other bars. The design of the bars attracts tourists as well as locals, and they are filled up all evening, even if it is a slow night and the other bars in the street is empty. Around eight o'clock the people start coming, and don't leave until one-two o'clock in the night. Erekle Street is one of the liveliest in Tbilisi. Both “Near Opera” and “KALA” offers live music; blues, rock, jazz and more. "Nineteen" is a small bar/restaurant in Erekle street which has a spectaculare well prepared menu. Do me a favour and visit it! Transport - choose the metro! Another pleasant experience is the metro. It is cheap, fast, old and reliable. That can also be said about the taxis, if you exclude the expression "reliable". The danger of getting killed in the old worn-out cars is present. Choose the well organized official TAXI service. You know them on the TAXI painting on the cars. Use the subway under the street if you want to cross it. The drivers in Tbilisi aims at you when you try pedestrian crossings. In the subways you will find all sorts of shops too. When you are tired of the apocalyptic traffic, enter the funicular up the hills from Tbilisi and enjoy a swim or a beer at Kustba, an artificial lake with all rights included. It’s mandatory to visit Narikala, the old fortress in the hills above the city center. It gives you a perfect overview of Tbilisi, but remember to bring lots of water. The hills are steep. 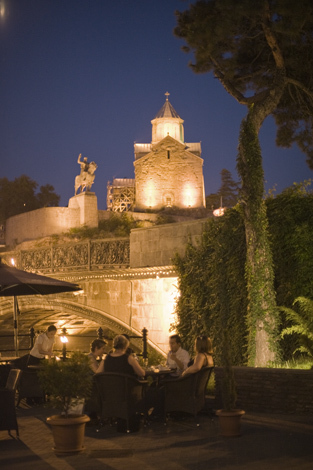 How to understand and enjoy Tbilisi? Just watch and learn. One thing: If you don't speak Georgian or Russian you're basically lost. What I find most pleasant when I visit the city is to walk around looking at people in the main streets, and enjoy conversations with friends at cafes and bars in the Old Tbilisi. I'm not much of a gambler, and nightclubs doesn't attract me either. So I might have missed something there. By the way, it is possible to enjoy great piano entertainers and jazz bands at the cafes. And it is very relaxing. 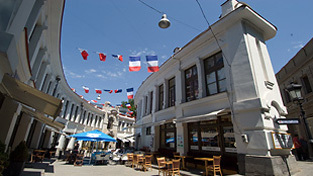 The Service is “French” and the same as in Batumi on most areas. Don’t expect too much, but try to understand how you would have managed if you one day in 1990 were placed inside the Soviet system and expected to adapt asap. The "KGB bar" and the "Near opera". Young urban Tbilisians are oriented towards the west. 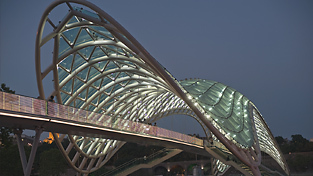 Saakashvilis new bridge designed by the architect who.. 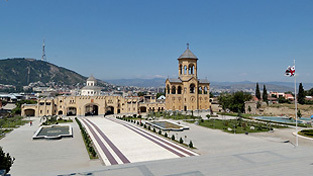 The Holy Trinity Sameba in Tbilisi. Old Tbilisi offers some sharp bars and galleries. A nice place for a drink or a dinner by the river bank. Narikala, in walking distance from the city center.